Tina Brown's Must Reads: The Republican Schism The editor of Newsweek offers some required reading on the gap between the Tea Party and the Republican establishment — and talks about the "Yes We Cain" issue of Newsweek, featuring Republican Herman Cain. "Herman Cain is surprising everybody," Brown says. The Daily Beast's editor-in-chief shares gems from the worlds of news, commentary and literature. 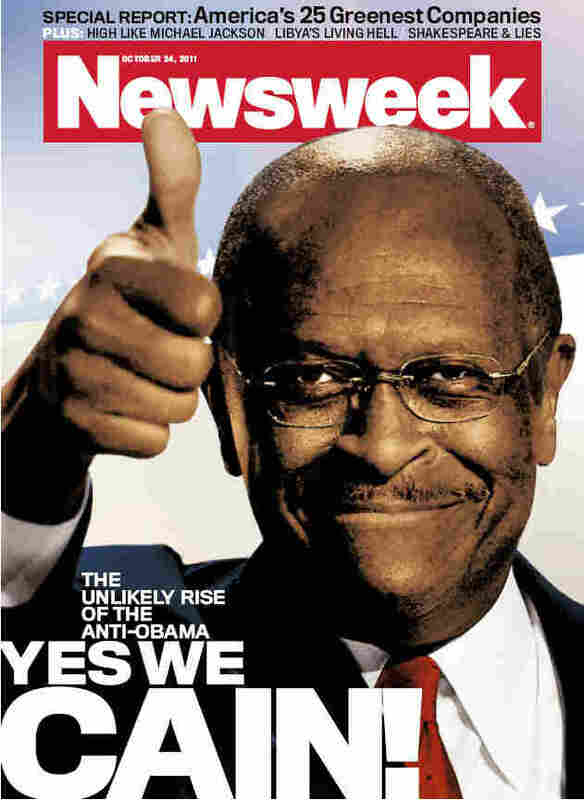 "Herman Cain is surprising everybody," says Newsweek editor Tina Brown. He's featured on the Oct. 24 issue of the magazine. Tina Brown, editor of The Daily Beast and Newsweek, tells us what she's been reading in a feature that Morning Edition likes to call "Word of Mouth." This week, Brown says the media is taking a closer look at the gap between the Republican establishment and the Tea Party. "There's a kind of firebomb that's about to go off when the debt talks again resume," she says. First up is Matt Bai's provocatively titled New York Times article, "Does Anyone Have a Grip on the G.O.P.?" "I found this a very interesting piece because he really delves into the whole kind of schism between the Tea Party and the sort of Republican establishment," Brown tells NPR's Steve Inskeep. Bai explores how the "establishment" is defined, and questions the perception that members of the Tea Party are "the kind of radicals who have always come to town with a fiery new idea and then become co-opted." Is the establishment co-opting the Tea Party or vice versa? Bai asks. "A reverse takeover could in fact be going on," Brown says. "Here are all these establishment Republican people [saying] over time, [the Tea Party] will get absorbed into the traditional sort of power hierarchies. But actually what we're really seeing is the other way around." Bai's reporting indicates that the Tea Partiers are a "new breed" of radicals who won't play traditional politics, Brown says. 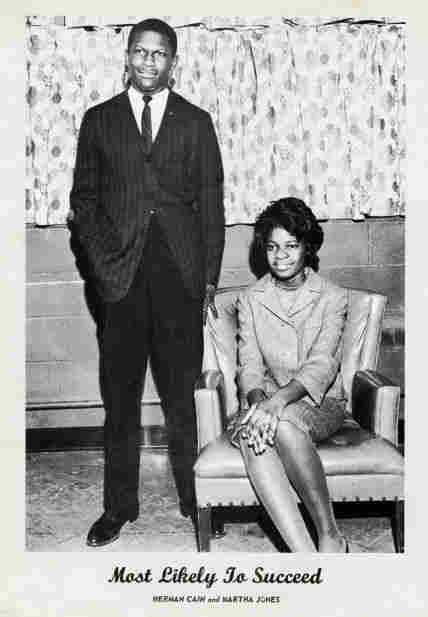 Cain graduated from Morehouse College, where he was named "most likely to succeed." The Republican Party would like to capitalize on the Tea Party's energy — but they're "playing with fire," Brown says. "The establishment wants to harness the fire of the Tea Party in order to kind of get Obama out of office. But it's a fire that you don't know where it's going to go. ... They cannot control it." It's a crisis of identity that is playing out in the Republican presidential primary, with competitor after competitor challenging Mitt Romney's grip on the Republican establishment. "Herman Cain is surprising everybody," Brown says. "That's why we put him on [this week's] cover of Newsweek. ... His performance in the debates ... has kind of catapulted him, and I think it's largely because he has positioned himself as the anti-Obama. ... It's an African-American rags-to-riches story that is very appealing." Brown says the Newsweek staff working on the Cain story came across wonderful photos — one in particular from Cain's college years at Morehouse. "He's standing there with his hand in his pocket, in a pinstripe suit and his legs planted firmly on the ground. It's a wonderful sort of period picture in a sense of African-American aspiration," Brown says. Cain's personal story is remarkable, Brown says, but his views on most issues are too "radical" for many Republican voters. "That, in a sense, is the great dilemma of the GOP at the moment," Brown says. "On the one hand, they want the energy that gets behind someone like a Herman Cain. On the other hand, they know they'll never get independent voters with the ideas of somebody like Herman Cain." Cain has said his fundraising is picking up, but his third-quarter numbers were far behind those of Rick Perry and Romney. "Perry is still the guy who has more chance, in a sense, of uniting the two areas of the Republican Party," Brown says. But Perry's debate performance "has been like a kind of a stunned ox. ... He has shattered any hopes that anybody really had in him because he's such a dire performer and just comes off as a guy who is 100 percent not ready for prime time." 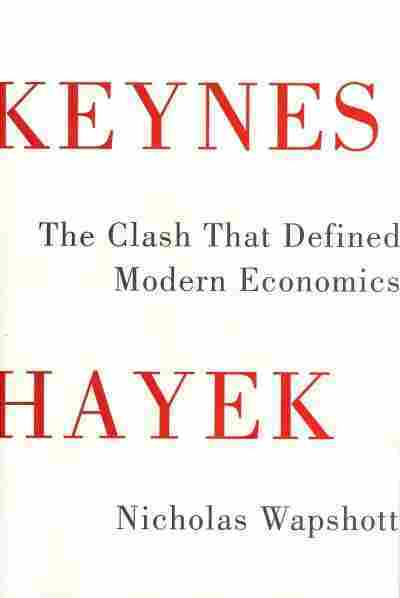 Brown's next recommended read is Keynes Hayek: The Clash that Defined Modern Economics by journalist Nicholas Wapshott. Keynes and Hayek were "two great economists of the '20s and '30s who had a tremendous feud that really continues to this very day," Brown explains. During the Great Depression, British economist John Maynard Keynes argued for deficit spending and investing in public works. Austrian economist Friedrich Hayek took the opposite approach and said the best thing to do in hard economic times was to cut services and spending. Wapshott describes the 80-year-old feud as a "poisonous, vituperative, intensely personal debate" — and one that defined an economic battleground where politicians still fight today. Keynesianism has fallen "out of style," Brown says. In the current economy, no one is willing to embrace big spending. "Even Obama, who may be a Keynesian in his heart," Brown says, "when he talks about ... spending and adding to public works, et cetera, he still is talking about cutting back. Even Obama now can't really admit to being the Keynesian that he probably is in his heart."